Tucked away from Gugeri Street is Claremont’s latest secret eatery, Tamarind Cafe. Tamarind Cafe is new to the Claremont dining scene as it has just recently opened 2 months ago offering a fusion of Australian and Malaysian dishes. Surrounded by residential apartments, the casual ambience and atmosphere at Tamarind Cafe with an alfresco dining area is suitable for customers to eat, relax and catch up over food. Tamarind Cafe is one hidden gem. As we were there on a Saturday night, we had no bookings and managed to get ourselves a table. 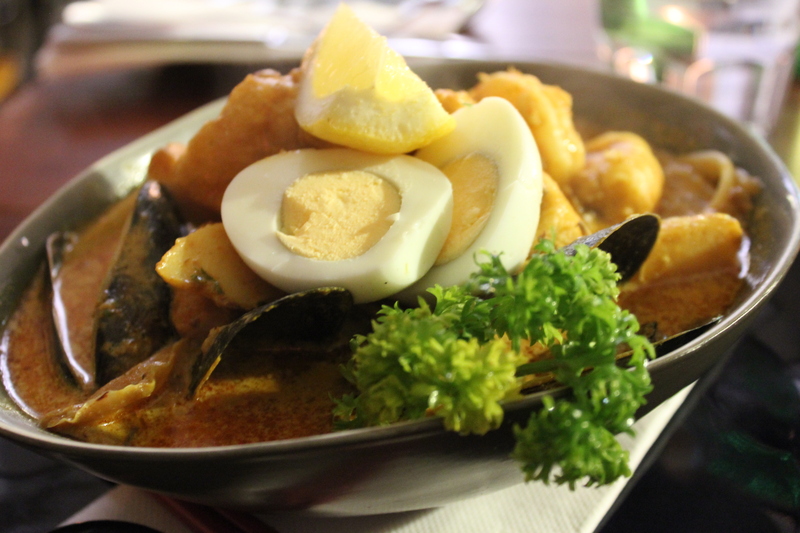 For the mains, mum had the Seafood Laksa ($19). The Seafood Laksa broth was thick, creamy and flavoursome. The noodles were also cooked well and there was a generous amount of seafood which adds a lovely punch of flavour to the Seafood Laksa broth. I had the Beef Rendang ($29) which was served with biryani rice, stuffed chicken wing, papadum and mixed steamed greens. 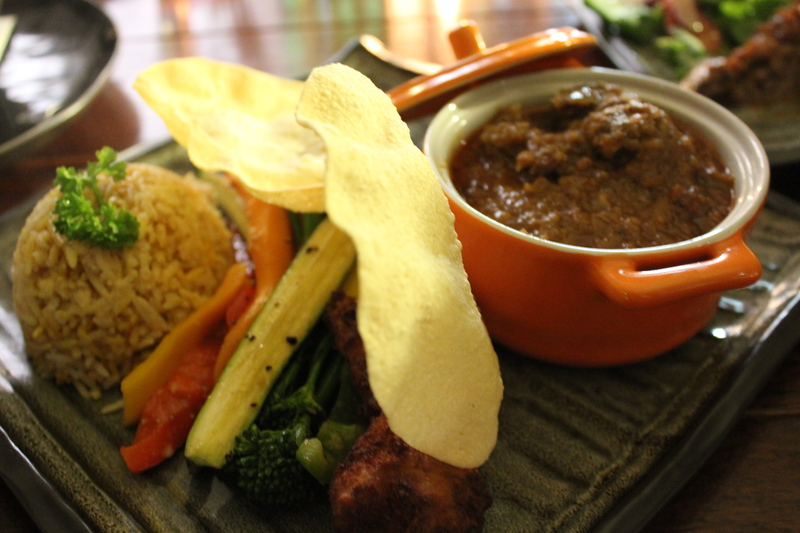 The beef rendang was delicious with a hint of sweetness and the beef pieces were cooked perfectly to tender. Together with the fluffy biryani rice, it was full of flavour. 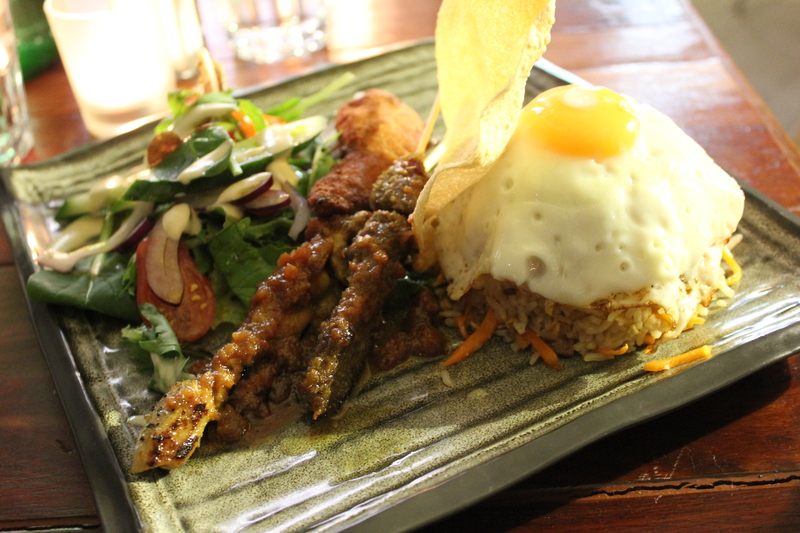 Dad had the Tamarind Nasi Goreng ($19) which consists of fried rice, stuffed chicken wing, beef satay and papadum. I had a taste test of the beef satay and it was marinated well, flavoursome and tender. It was authentic. Now I know where to get my satay if I am craving for it! 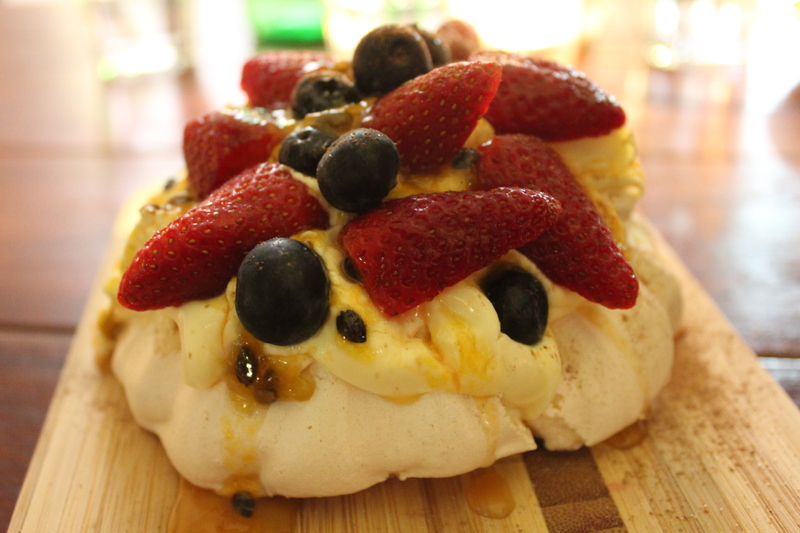 To finish, we had a Pavlova ($12) to share. The Pavlova was melt in your mouth delicious. It was crunchy on the outside with its soft, mallow texture on the inside. It was definitely a winner for us. The strawberries and blueberries also gave a hint of freshness and sweetness to the Pavlova. I enjoyed and had a great dining experience at Tamarind Cafe. It definitely had a relaxing and casual atmosphere and the staff are very friendly too. Parking is also not a hassle as you can park at Claremont Quarter for the first three hours. Come on the first Sunday of the month for some Malaysian specials and stay updated with Tamarind Cafe’s Facebook page. Yeah they did use spaghetti noodles in their laksa. Apart from that, the food was quite authentic 🙂 Loved the satay!